The Racing Motorcycle, Volume 3: An Introduction to Chassis Set Up. This manual is a must have for aspiring road racers and tuners as well as seasoned pros! A full 410 pages, this guide to chassis set up by John Bradley, is aimed at anyone who is just starting racing or who is responsible for building and setting up a race bike. Chassis set up is an individual thing -- totally dependent on the bike, rider and track conditions. Because of the variety out there, it’s impossible to satisfy individual needs. 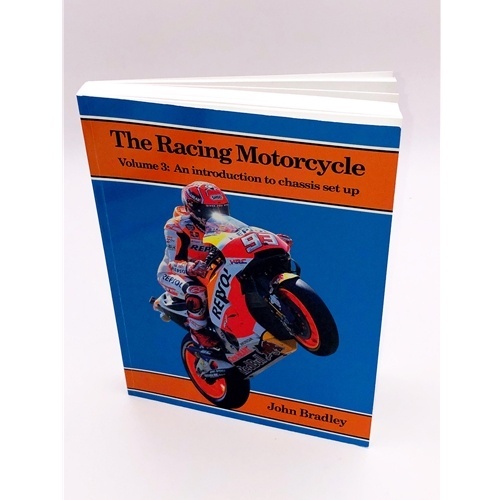 However this book provides awareness of the aspects involved, and an understanding with a method of approach that can then be applied to any rider’s situation. No background is assumed, other than the ability to work on the bike and a basic familiarity with bikes. There are a large number of helpful comments on the effects of chassis set up from world class riders. Providing premium road, racing and off road motorcycle suspension components to North America.